We get a lot of questions about security cameras. Our readers want to know what certain features entail, what type of camera fits their needs, and more. Don’t feel overwhelmed by the different models and functions. We’re here to help you. Our frequently asked questions can help answer some questions for you and hopefully keep intruders away. And if you need help choosing which camera is right for you, check out our list of the best home security cameras. Do security companies have access to my security cameras? Can video footage help me when prosecuting? What are the ways my security footage can be stored? Can I use an indoor camera on the window to see outside? There are numerous security cameras available, each one with different features and benefits. Depending on your location and needs, you may find yourself wanting a specific model. Features to consider include indoor, outdoor, night vision, pan, tilt, and zoom capabilities. Besides these features, you’ll also want to think about the style of camera. Below are some different styles to consider. These cameras typically don’t record 24/7 so they save you a lot of video storage space. They sense movement and only record at times where activity is taking place. These cameras typically alert you of any activity. Some of these cameras can follow the object through the room if it stays within range. A nanny cam is used to monitor your nanny and child while you’re away. These are typically hidden, but we recommend you tell your nanny you are recording him/her. These are pretty self explanatory. They can be indoor or outdoor and are meant to record footage at night by illuminating poorly lit areas. This is a common feature for most security cameras, however, it’s important that you make sure your camera has this feature because there are still some cameras without it. Outdoor cameras should have night vision and be weatherproof. These cameras can be used to monitor your yard, front door, shed, or other outdoor space without you having to physically be there. What’s the difference between fixed cameras and pan/tilt/zoom cameras? Well, fixed cameras typically have minimal features. They do not pan, tilt, or zoom. They perform the basic security camera job, recording footage of the area within the camera’s range. On the other hand, pan/tilt/zoom cameras have the ability to move. While some cameras with these capabilities can be repositioned remotely, others must be repositioned by hand. It’s more convenient to have a camera you can reposition remotely, so be sure to check the camera you are considering purchasing. As for the range of motion you can expect, this can vary. First thing, is the field of view for the lens. Secondly, is the amount of panning, tilting and zooming the camera allows. Again, this is something you’ll have to look into for the camera you are interested in. However, for the most part, pan/tilt/zoom cameras allow you to see a large amount of a room (if not the entire room). Some cameras have 4x zooms while others have 8x (or even bigger). Some cameras can even be activated by motion and follow moving objects. The most common cameras on the market are WiFi enabled, meaning they are connected through your Internet connection for you to monitor remotely. These are typically pretty easy to set up (plug and play style) and can be controlled from an Internet-enabled device. These types of cameras include Nest Cam, Piper, Canary, some security system cameras, and more. These cameras are appealing because they don’t have to be hardwired into your home, which means no holes in your walls. Don’t confuse these with wireless cameras though. Wireless cameras need no connection to a power outlet or wires connecting it to other devices, aka it is truly wireless. These types of cameras get their power from batteries and have to be replaced frequently. Security companies like Frontpoint, ADT, Protect America, and Vivint do not have access to your camera’s footage or images. Security companies only have access to these things if they offer video monitoring as an add-on service with extra fees. Not all security companies offer this, so check to see if your security company does. Yes! Anyone with security camera footage of a crime being committed is responsible for giving it to law enforcement. This can help apprehend the criminal and by not turning the footage over, you could be obstructing justice. This includes indoor and outdoor security camera footage owned by businesses or individuals including ATM cameras. How Is my Security Footage Stored? There are four ways your security footage can be stored. These methods can vary depending on the type of camera you own. Each camera performs differently from others so it’s hard to say, but generally cameras don’t perform well when aimed through a window. The camera often focuses on the window or a mark on the window instead of the event taking place outside. No, not all cameras are completely wireless. Most cameras need to be plugged into an electrical outlet. However, if they are battery operated then they are probably wired into a DVR, VCR, or other system to transfer the data so it is viewable. Be sure to check what types of wires your camera needs before purchasing. Safety isn’t a joke and it’s important that you protect your home and business before danger strikes. Video surveillance is a great way to protect your property and the people you care about. 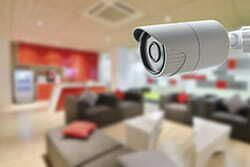 Security cameras are growing in popularity and becoming more affordable for the average person. We suggest making a list of the features you want in a camera and beginning your search with that criteria in mind. As always, feel free to ask us any questions. 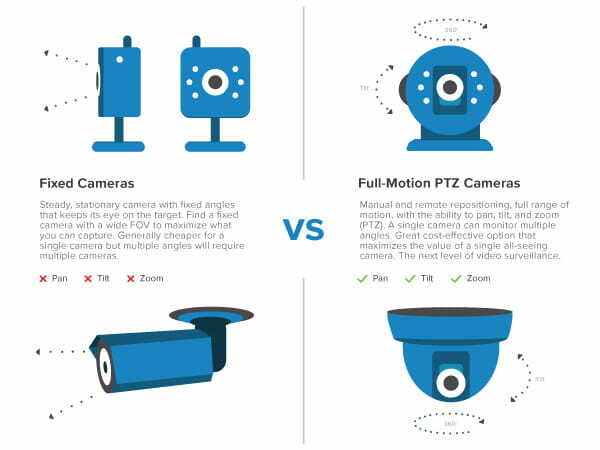 We can help you distinguish between a few cameras you’re considering or just help you learn more about these devices. We’re here to help you find the best camera for your needs. What questions do you have about home security cameras? Now that you’ve learned more about home security cameras, feel free to take a look below on Amazon for the type of camera that might fit your needs. Don’t forget to have that list of features you want on hand so you can narrow your search down to find the best home security system.